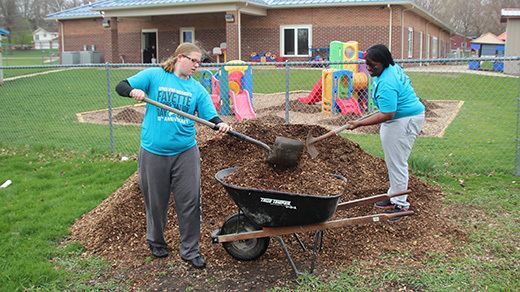 Fayette Appreciation Day is among the many community projects that Upper Iowa University students, faculty and staff conduct on an annual basis. For participating in these and other service projects, UIU has once again been named to the President’s Higher Education Community Service Honor Roll. Upper Iowa University has once again been named to the President’s Higher Education Community Service Honor Roll. UIU was named to the General Community Service category, which recognizes institutions that make a commitment to improving the quality of life of off-campus community residents, particularly low-income individuals. Organizations or service projects that UIU students, faculty and staff have participated in over recent years include Fayette Appreciation Day, Special Olympics, Alternative Spring Breaks, Dance Marathon, Cancer Research, Make-A-Wish Foundation, Academic Service Learning in the Classroom, and various volunteer projects at Fayette Campus and UIU centers. “A large number of UIU volunteers deserve recognition for this honor, but we are especially proud of our students, who continually exhibit goodness and compassion for the entire community,” said UIU Peacocks for Progress President Christina Kirwan, while expressing her appreciation toward Grove and former Peacocks for Progress President Emily Marvin for writing the Honor Roll application. The Honor Roll’s Presidential Award is the highest federal recognition an institution can receive for its commitment to community, service learning and civic engagement. The honor roll recognizes colleges and universities for the role they play in solving community challenges and, as a result, more students are likely to pursue a lifelong path of civic engagement that achieves meaningful and measurable outcomes in the communities they serve. The Corporation for National & Community Service (CNCS) has administered the award since 2006 in collaboration with the U.S. Department of Education and the U.S. Department of Housing and Urban Development, as well as the American Council on Education, Campus Compact, and the Interfaith Youth Core.